A man named Don was faithful in every testimony service to stand up and say “I thank Jesus for my salvation.” I do not remember a time when Don would not say something good about Jesus when given the opportunity. His testimony encouraged several preachers I know to serve the Lord in ministry. Perhaps you enjoy hearing people give their salvation story. Sometimes church services are blessed when people rise and vocalize what God is doing in their lives. A Testimony is evidence given in court from an eyewitness accounting details of a case. It is proof that supports a claim or a fact. A Christian Testimony is when we are telling others what God has done for and in our lives. It is giving evidence that God is working in our life. What can you say about God in your personal testimony? What does your testimony say about Jesus? Testimony is more than reputation. Reputation has to do with how you are known to other people. Testimony has to do with how you live and what you say about God to other people. Here are 4 ideas to help you share your Christian testimony. Perhaps an entire life story is needed to be told to let others see Jesus in you, but generally, the most meaningful parts of what God has done in your life is all that is needed. Give Insight with Considerate Conversation. Colossians 4:6 teaches, Let your speech be alway with grace, seasoned with salt, that ye may know how ye ought to answer every man. Be careful not to pour salt on somebodies wounds. Others who hear your testimony may be grief stricken about sin or a circumstance. Be careful to consider their thoughts. Others are in the middle of a similar lifestyle you used to live. As you speak, they may be battling the same depression, drunkenness, or abuse that you endured. Great details of sin need not be given. When the apostle Paul gave his testimony, he did not include the gruesome details of Stephens death, or of the families that he tore apart. Paul spoke in general terms. We must avoid magnifying the depth of sin. Exalt the forgiveness of God. Show Thoughtfulness With Godly Preparation. Proverbs 16:1 instructs: The preparations of the heart in man, and the answer of the tongue, is from the LORD. It is a good idea to ask the Lord to help you prepare your testimony beforehand. Not every occasion for verbalizing a testimony will be formal, but for those formal settings, you should be prepared with what you will say. Let God help you prepare ahead of time. Of course, He can give you the words before and even during the testimony. Think about your story of God working in your life. Know how to tell His story in your life. Rehearse the story. The more you tell it– the easier it is for you to recognize you are blessed and it is easier to tell others. Many Christians who battle depression are simply not “practiced up” at telling others about God working in their lives. Be rehearsing what God has done. It will help you in many ways. Be Happy Using Joyful Expression. Proverbs 15:23 A man hath joy by the answer of his mouth: and a word spoken in due season, how good is it! Giving a testimony, the right way and the right time is a wonderful thing. Recalling forgiveness of sin, victory in Jesus, and the power of the Gospel is terrific. Remembering our future with Jesus is inspirational! Smile, have your eyes open; speak confidently and joyfully about the Lord Jesus Christ. Ask the Lord to help you have the joy of the Lord evident in your testimony. With these testimony ideas in mind, I encourage you to rehearse your salvation testimony this week, and then relate the testimony to someone soon. This entry was posted in Bible Truth for Today, Counseling for the Soul and tagged encouraging, joy, motivational, others, Praise, Salvation, service, story, Testimony, Thanksgiving on October 22, 2015 by pastorharness. I was blessed in early 2015 to be given a trip to the Holy Land. The Wilton Baptist Church, the people I pastor, sent me on a trip of the lifetime to Israel. I am very thankful for their generosity and kindness! It was an incredible experience that really brought to life the Bible locations that I study each week. It was a life-changing time for me as the pages of Scripture took on a fresh interest. The landscape and having been “on location” has helped me further understand the events of the Bible in relation to geography, weather, and human experience. For example, walking up to the Mount of Olives means more to me now after having walked it on a sunny day. Traveling across the Sea of Galilee during a storm was exciting! The wind and rain assaulting our little ship gave me a glimpse of the times when Jesus sailed the Sea. Dr. Richard Harper, the evangelist, and myself are planning to go again in February of 2017. In 2015, we went to nearly 60 locations and I took around 4000 photos! 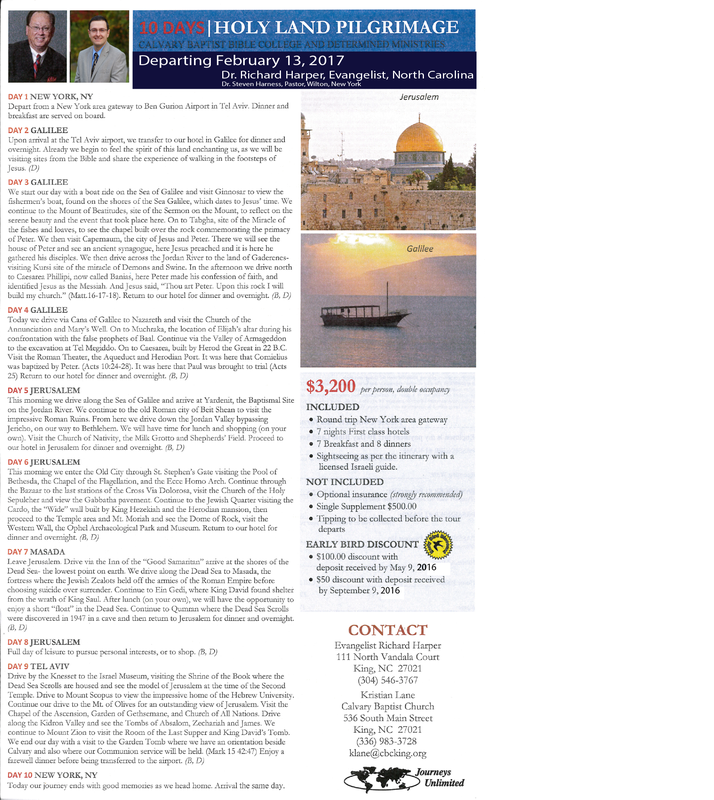 Below are the details of the 2017 trip. Perhaps you would like to go. I encourage you to sign up. If you send your pastor, his preaching will never be the same. I encourage churches to send their pastor as it will not only bless him, but will also reciprocate in stories, photos, and greater depth of understanding that will return to the church from the pulpit. A person does not need to go to Israel to be a great preacher or to know the Bible, but visiting there can be a help to gain insights that you may not have considered before. Please read the details below. Begin to pray and begin to save money for the trip if you feel the Lord would have you go. This entry was posted in Bible Truth for Today and tagged Bible, Holy Land, Isreal, Tour, travel, Walk Where Jesus Walked on October 1, 2015 by pastorharness.